Getting married? Already have all the pots, pans and the works to set your new home? Afraid you might recieve the same Corelle dinner set five times over or worse 4 different kinds of cuckoo clocks. Bottles of wine would've been better, we agree! We feel your pain dear newly weds. So we are here with some brilliant advise today. We will tell you how, you can sneakily ask for the 'lifafa' aka envelope without sounding cheap. After all, this is one kind of gift that will always come in handy. 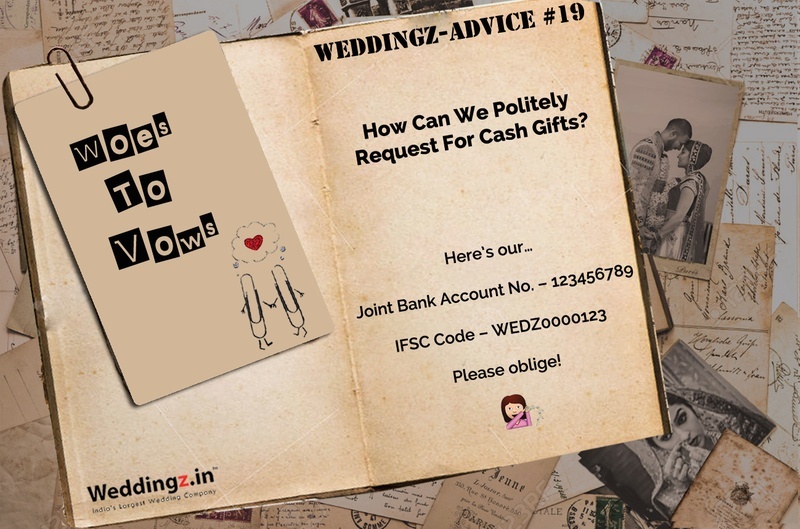 How to politely ask for cash as a wedding gift without offending your guests is a question every bridal couple has on their mind. As aforementioned, directly putting it all out there in bold and slamming it straight on your guest’s faces that CASH is what they should be handing out to you on your wedding day can be considered rude by some, especially those who have already decided to hand you something from the 'recycling closet'. There are other subtle ways than your wedding invitation to put this information out to your guests. At least to the right ones who’re more than willing to gift you what you want rather than what they think you want. Start with your friends and family. Let them know in the subtle to humorous manner that yes, gifts in cash are welcome. Also, tip your loved ones to spread the word to those who don’t directly communicate with them that if anyone asks what the couple wish for their wedding gift, its money, money, money! You can choose to add a reason that you need it for your honeymoon, donate it to charity or pay off your loans, there is no shame in that. And, it’s an old wives tale, word of mouth spreads faster than any other medium. If you still wish to go the daring way and choose your save the date or wedding invitations to blurt out that you wish to receive cash as your wedding gift, then ensure you choose the right kind of words. You can either opt for a funny poem like the one in the picture above to add a touch of humour or simply state - No boxed gifts please or only flat gifts will be appreciated. A concept of the west, wedding websites and wedding registries are soon catching up in India too. Since the whole world is online, including your great grandmother posting those cool lip pouting selfies, it is more than convenient now for everyone to simply tap online and browse for information. Wedding websites and registries are cool ways of sharing your wedding information online with your guests. This way they know exactly what and where is the event through the website, as well as catch up on all the wedding gossip and through the registries know exactly what the couples want for their wedding and what they can gift them within their budget. Couples can either choose to keep a cash registry or have a wedding registry of items you need and let guests pay online for those things. Quite a cool and advanced technique, eh! If you have your kakaji or NRI maasiji writing down a cheque for you, ensure that the cheque is not written with the name of both the couples on it and/or with the bride’s new surname. If the cheque is being addressed to the bride, it should be written with her maiden name, just in case the bride decides to not change her surname after marriage. If she chooses to change her surname, the process will take a while causing a delay in encashing the cheque. Last and most important rule you should never forget is to send out personal thank-you notes to all your attendees in the form of a small return gift or wedding favour, text message, hand-written card, phone call or an email. Anything will do. It’s just a sweet gesture.